The blueberry and banana smoothie is so full of health and energy that it will win all the smoothie awards from……. ‘Me’. Okay, jokes apart, it’s truly amazing. Not only does it look gorgeous and taste great, but this – let’s call it B&B – smoothie is brim-full of antioxidants. And why do you need brim-full of antioxidants? Well, you need them if you want to look healthy, have glowing skin and a head full of gorgeous hair, and joints so flexible and strong that you can run a marathon. Basically, antioxidants slow down aging. A higher score means more antioxidant power to fight free radicals. You must have heard about free radicals in relation to aging. They are unstable oxygen molecules that cause oxidation, or “rust”, in our arteries and organs. Unfortunately, you can’t avoid free radicals. Free radicals are a byproduct of regular metabolism. But they can also enter your system when you eat junk and fried foods or when you breathe polluted air and tobacco smoke or drink alcohol or stress too much. Free radicals can cause heart disease, certain cancers, memory loss, muscle and joint pain and vision trouble. The most visible effects of free radical damage are wrinkles, age spots, saggy-looking skin, grey hair as well as thinning and hair loss. The good news is that you can stop the free radicals from causing menace in your life by upping your intake of fruits and vegetables – all of them contain antioxidants. They will neutralise free radicals and help slow down your body from aging. But why give special attention to blueberries? Because they top the antioxidant charts and like in general life everyone kind of gives special attention to toppers, so blueberry too gets special attention. And that’s the reason many researchers have started taking interest in this little berry. 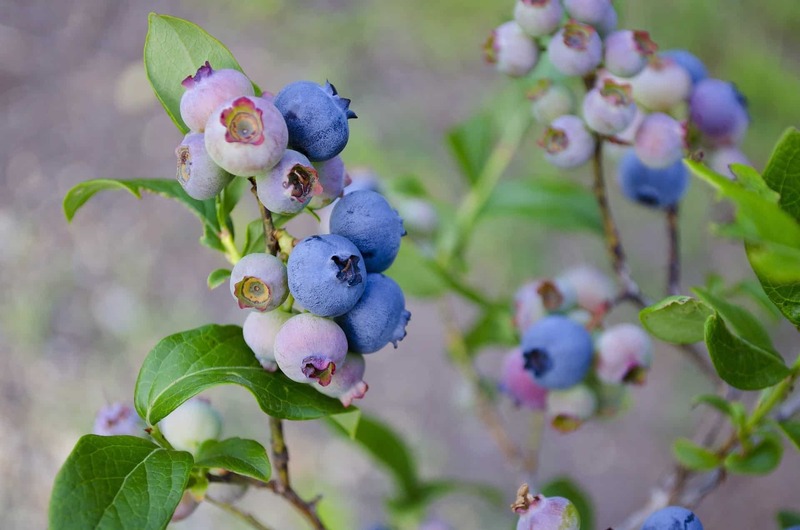 Blueberries get their gorgeous deep blue colour from anthocyanins. Blueberry also contain other amazing phytonutrients such as resveratrol and pterostilbene. These not only act as antioxidant nutrients, but they also have anti-diabetic, heart-protective, brain-protective, anti-inflammatory and chemopreventive (anti-cancer) properties. Blueberry can keep you away from a number of diseases. Multiple studies show that blueberries can help lower blood pressure and reduce arterial stiffness. This super berry has also gained a reputation for being a top brain food that can boost memory and slow cognitive decline, even in old age. It’s a wonderful snack for little children as it helps their brains stay sharp and provides them with energy. In a 2016 study, primary school kids who drank a blueberry smoothie did much better at mental tasks compared to those who had a different drink. 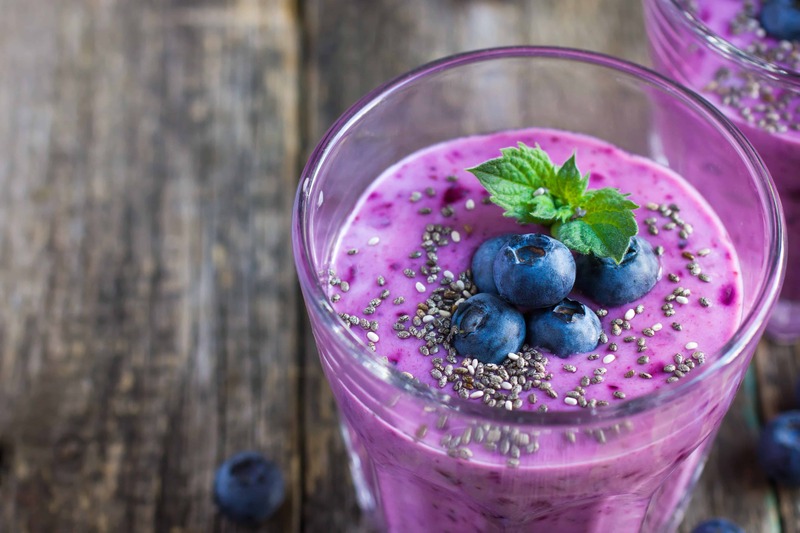 A similar study, done with young adults, also reported improved learning and alertness after drinking a blueberry smoothie. No wonder my every cell feels energised and awakened after drinking B&B smoothie. 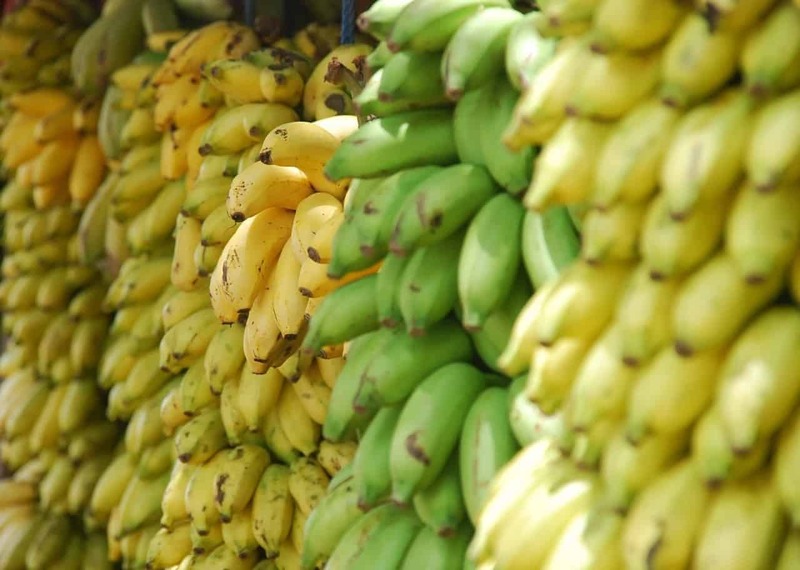 After singing so much praise for blueberry, the humble banana is not just a filler. It too has its own share of goodness. Banana can give you quick boost of energy but without the crazy side effect of candy or cola. No wonder it’s a favorite fruit among athletes and tennis players. You have probably seen champion tennis players Federer, Nadal and Djokovic munch on bananas in between sets. Even though banana is quite sweet and contains natural sugars (fructose and glucose), it still gets the low glycemic index (GI) rating. And is even recommended by American Diabetes Association for its multiple health benefits. The natural fruit sugar combined with fiber and complex carbs does the trick. Banana is also a great stomach soother. From bloating to diarrhea to constipation to everything in-between, banana keeps your gut healthy and well. The pre-biotics and fiber that you find packed in fancy bottles are naturally present in this lovely fruit. A healthy gut means you will absorb the antioxidants, vitamin and minerals from the foods you eat better. And these nutrients will in turn feed your skin, hair follicles, and body, so no more dull skin, falling hair and aching joints. Besides, if you are trying to lose weight and want to skip banana, don’t. Bananas are real low on fat and contain amazing plant sterols that not just help with fat burning but also keep cholesterol levels in check. 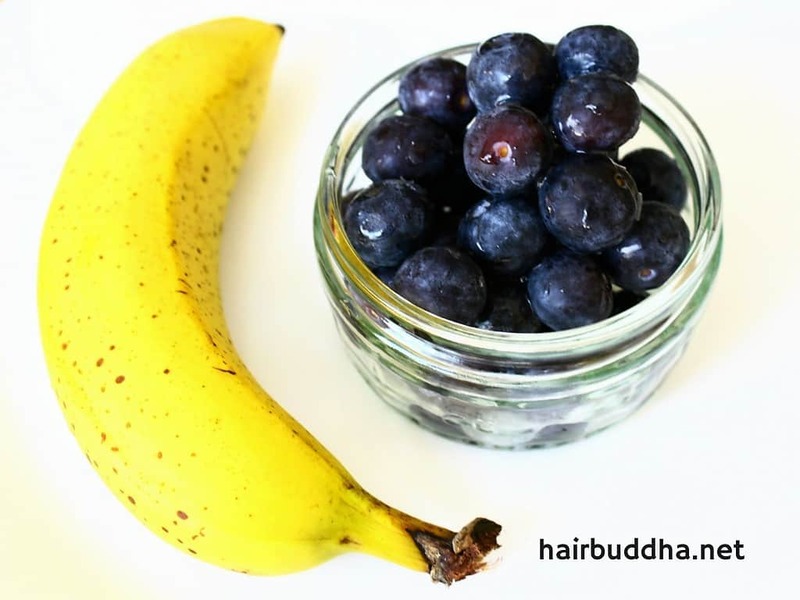 Since we are hair obsessed people, the banana will help beat bad hair blues. It’s high in vitamin B6 and magnesium, both of these will pull you out of frustration and fill you with enthusiasm to make your own hair rinse and natural shampoo, instead of just emptying synthetic products on your hair. Okay, enough of blueberry and banana gaga, let’s get to work and make the B&B smoothie…shall we. 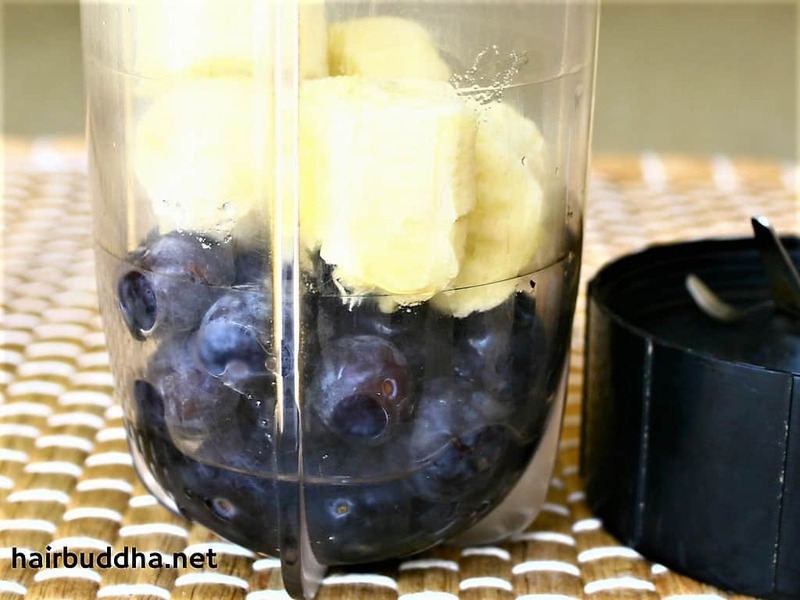 Place the blueberries in a blender, and slice in the banana (and other optional ingredients). Add some water and whizz together for a few seconds until smooth. That’s it. Pour into a glass and enjoy this delicious smoothie! To make B&B smoothie, you need 1 banana and 1/2 cup blueberries. Add some water and whizz until smooth. You can also add coconut milk, almond milk, chia seeds, ground flax seeds or other fruits. Drink or eat with spoon. What is the best time to drink this smoothie? The first thing in the morning, before breakfast, or after exercise or run. You can also drink it as a mid-afternoon snack. Can I add more fruits? Yes, you can add other fruits like apple, raspberry, strawberries, orange etc. But avoid melons, as they are not team players and don’t like to blend in with other fruits. Can I simply eat blueberries and banana? Yes of course, and save yourself work of blending and washing up. Do you enjoy B&B smoothie? Have you noticed any positive effects from drinking it?